There are a rich set of reference materials that have been produced by Toastmasters International and by individual Toastmasters around the word. Below are a collection of PDF's and Images that will help you understand the breadth and depth of the Pathways Learning Experience and how to use the Pathways online tools to progress through your Projects, Levels and Paths. Pathways Infographic - A detailed, color-coded one-page overview graphic of Pathways. Pathways Companion Guide - Use this guide as a companion the The Navigator. I will assist new members who are just beginning the Pathways Learning Experience and will be useful as an ongoing reference to members already working in Pathways. Pathways Paths and Projects Catalog - To assist you in selecting your Path(s) this catalog describes each of the 10 paths and all the projects. In this PDF you can explore the projects and speeches within each path by clicking on the Path that interests you. The Navigator -This PDFis filled with information essential to understanding your Toastmasters journey and how the Pathways learning experience is integral to your journey. Use it to help you begin your journey and support your progress along the way. Pathways Fast Start - An excellent step-by-step guide with screen shots. Courtesy of George Marshall, District 57 Chief Pathways Guide. Getting Started Using Pathways - A two page PDF offering a high level overview of starting and navigating Pathways. Pathways Paths and Core Competencies - Excellent graphic of the relationship between the Five Core Competencies and the Ten Paths. Also includes all the Projects and Electives for each Level in each of the Ten Paths. Pathways Projects Matrix - Color coded matrix graphic of the entire Pathway Learning Experience. Includes all the paths, projects, electives and levels. Excellent visual to show the commonality and differences between paths. 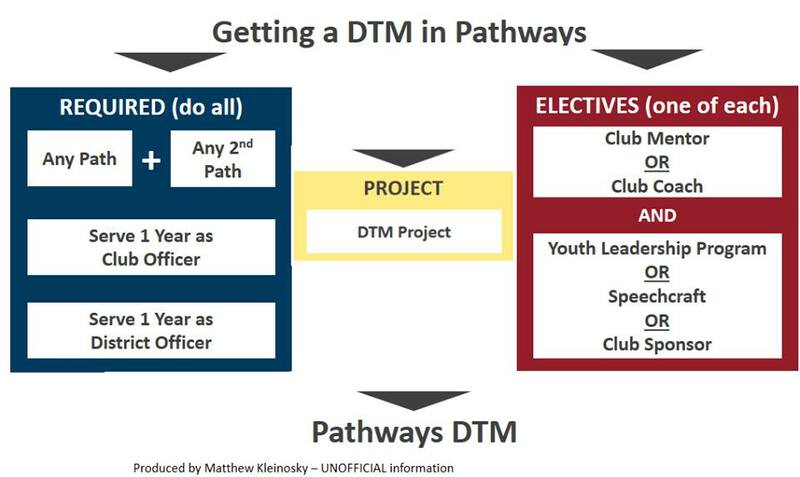 Pathways DTM - Graphic that shows all the requirements for getting a Distinguished Toastmasters (DTM) award in the Pathways Program. Getting Started Using Pathways Base Camp Manager - If you are a Base Camp Manager responsible for approving completion of a Level by a member - this graphic based PDF will step you through the process.